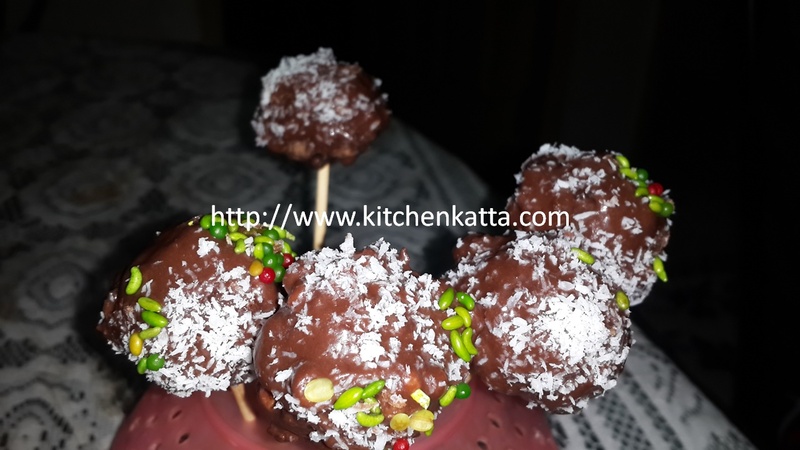 Here is an interesting recipe of quick dessert which looks attractive and tastes yummier. Kids are surely going to love it..
4. Rest for 2-3 mins. Prepare a microwave safe bowl with greasing and dusting. 5. Pour the cake batter in the bowl. 6. Cover with the lid and microwave on high for 3 mins. Open and release the steam. Again microwave on high for another 2 mins. Alternatively you can use any vanilla cake and follow remaining procedure for making pops. 4. Now melt the chocolate with double boiler method. Keep the hot water around to maintain chocolate consistency to melted. 5. First dip one side tip of the stick in chocolate and roll over such that the tip is covered with chocolate. Insert the stick in one of the balls. Repeat for all balls. Let it set for few mins inside fridge. This will give stiffness to the pop tick and cake ball joint. 6. 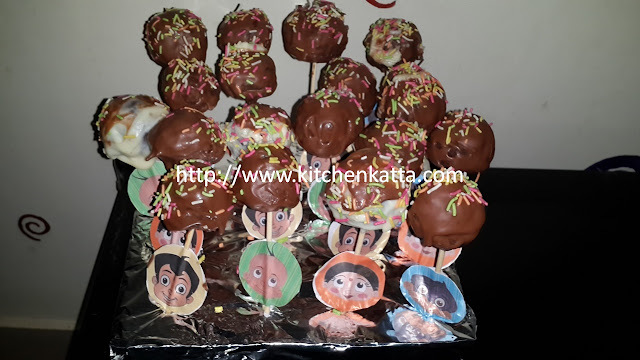 Now gently roll each cake pop in melted chocolate, sprinkle the color vermicelli or sprinklers on it and set aside. Server your cake pops at room temperature. Here is another version where I have used desiccated coconut and color saunf for decoration.